Enjoying beautiful surroundings, great food and entertainment, more than 300 people attended the 19th annual Great Cowley Duck Dash held Saturday at Winfield’s Spring Hill Farms. The Great Cowley Duck Dash, which featured a duck race, raffle and duck squat, has raised nearly $300,000 for student scholarships over the past 19 years. Dr. Dennis Rittle, Cowley College president, entertained the crowd as the emcee for the races. 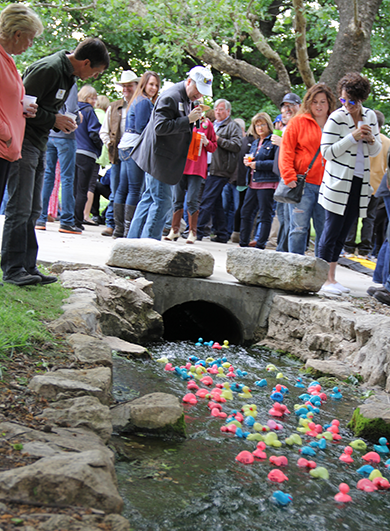 Edward Jones was the winner of the duck race and the $1,000 cash prize. Jana Wooderson was the winner of the duck squat and was awarded $500. There were also raffle winners at the event and 694 ducks sold for the duck race. Great Western Dining catered the dinner. Please look for the insert recognizing the sponsors in the Arkansas City Traveler and Winfield Courier newspapers. *BBQ Basket provided by Union State Bank and $100 gift card to WB Meats courtesy of Steve English, Trust Company of Kansas – Dr. Harold Arnett.